A blood sea star (Henricia Sanguinolenta) photographed at Folly Cove on Massachusetts’ Cape Ann. BLOOD STARS (HENRICIA SANGUINOLENTA) ARE OFTEN DARK RED, SMALL AND TALKATIVE – well, this one looked like he ought to be, anyway. I always thought that if Pixar made a film featuring this blood star, it should be played by Billy Crystal. I digress. They’re found from the far northern Atlantic to as far south as Cape Hatteras. The book says they’re as big as four inches across. All those I’ve seen, in New England, are smaller – this little guy was only about two inches – but another book says they’re increasingly bigger the farther north they’re found. A GRANULAR COVERING OF SMALL SPINES Blood stars have small central discs and five pointed arms with two rows of tube feet on their bottoms. As good echinoderms, their upper surfaces are covered with spines. 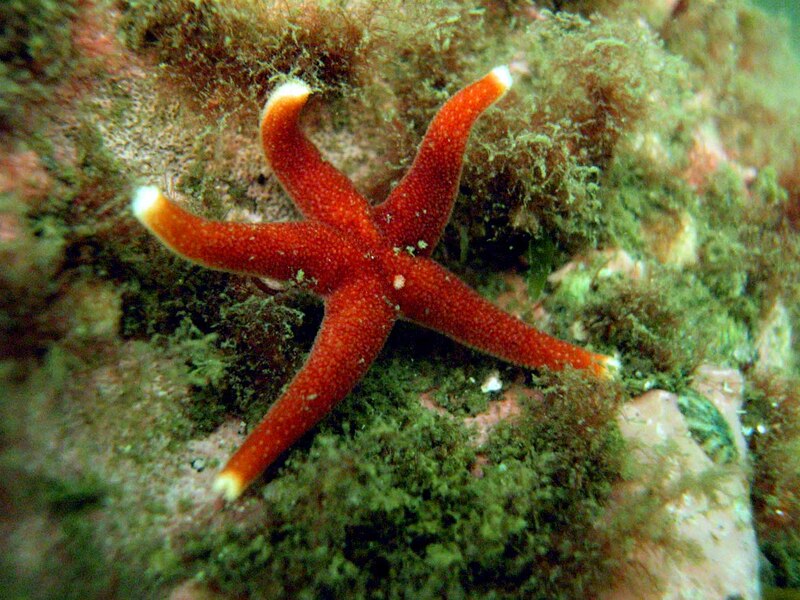 In the blood star’s case they’re small, equal-sized spines that form a fine granular covering. In New England, they’re generally found in shallow waters, but they inhabit deeper regions in the southern portions of their range.They’re generally described as feeding on sponges, but Andy Martinez in his Marine Life of the North Atlantic guide cites some studies as suggesting their food of choice is particulate matter on the sponges’ surfaces. Blood stars in the category of sea stars that brood eggs and bypass the stage of free-swimming larvae. Principal Sources: Marine Life of the North Atlantic, Andrew Martinez; Peterson Field Guide to the Atlantic Seashore, Kenneth L. Gosner.